First published 9 May 2012 Canberra Times. Not only does Mother’s Day provide the opportunity to lavish attention on Mum, it’s also an excuse to showcase your cake baking skills. These gorgeous little powder puffs are incredibly quick and easy to make, and they can be produced at very short notice, perfect for the kids or Dad to cook for Mum on her day. 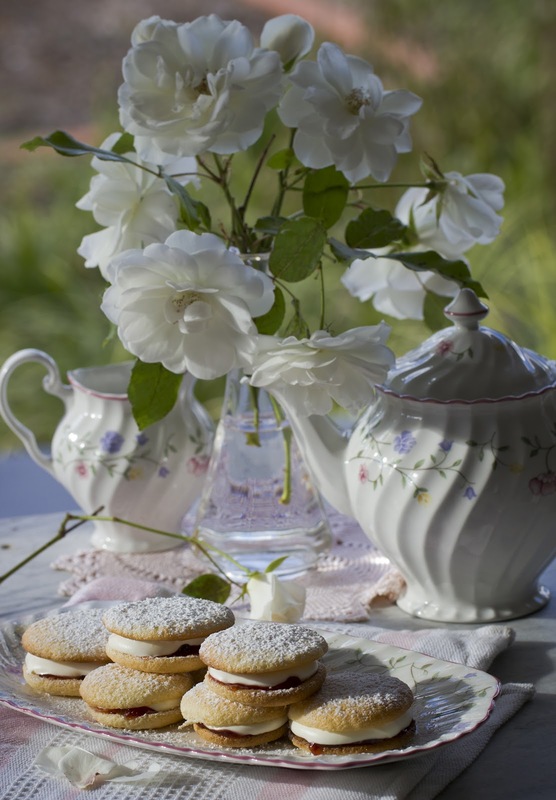 This cute old-fashioned English recipe dates back to when the vicar would drop by for afternoon tea. The cakes were baked in advance and stored in an airtight container, then filled with whipped cream and jam, sprinkled with icing sugar and put aside. They rise again slightly when filled and left for an hour or so. By the time the vicar came to call, the powder puffs were ready to eat. Preheat the oven to 220C. Line 2 baking trays with baking paper. Beat the eggs with an electric mixer until well mixed, then gradually add the sugar, beating for 8 minutes or until thick and creamy. Sift the flour, cornflour and baking powder together and fold in lightly by hand. Put the mixture into a piping bag fitted with a plain 1cm nozzle and pipe into rounds, placing them well apart on the trays. If you don’t have a piping bag, spoon teaspoons of the mixture onto the trays. Bake for 4 to 5 minutes until evenly but lightly coloured. Remove from the oven and lift the cakes carefully with a spatula, onto a wire rack to cool. When cool store in an airtight container, separating the layers with sheets of baking paper to stop them sticking together. An hour or so before serving, join the cakes together in pairs with strawberry jam and whipped cream. Dust them with icing sugar and place them in a covered container until they become light puffs. First published Canberra Times 2 May 2012. Descending the ladder very carefully with a colander of late harvest figs tucked precariously under my arm, I notice there are still a lot of unripe figs left on the tree and some that have been half munched. Already planning the next harvest, I dream of an early winter Italian style lunch dessert, stuffed with chocolate, nuts and preserved in brandy. I replace the netting, do a boundary check of the fig tree and I believe it to be secure. The possums around here are pretty sneaky and I wonder if they are watching, planning their night assault, while my guard Spoodle snores under his fluffy doona, and doesn’t give a fig about guarding the tree! A number of today’s harvested figs are just verging on the ripe side, and will be chopped and poached in star anise, cinnamon and pepper to form a sauce. This will work well with roasted figs and pre-made caramel and balsamic ice cream that is already languishing in the freezer. The sharpness of the balsamic vinegar, balances perfectly with the large, musky figs and will make a fine ending to our family lunch. As it’s a special occasion, I decide to fancy up the dessert by adding some honey flavoured wafers, known as Tuiles in France, that I curve over a rolling pin while still warm, creating a little nest for the caramelised figs to sit in. This is a simple and impressive technique and easily done ahead of time. The three components of this dessert can all be made separately, in advance and can be used individually. If you choose to make only the caramelised figs with the ice cream, or the ice cream with the wafers, the flavours will still work well. Firstly, make the ice cream. You will need to prepare it at least the day before you need it. Combine the sugar and just enough water to cover in a small saucepan and stir until the sugar has dissolved. Bring to the boil, without stirring, until the syrup becomes a light golden colour. Remove immediately from the heat and carefully add the 60ml of balsamic vinegar. Return to the heat and stir until smooth, then remove from the heat and allow to cool to room temperature. Refrigerate until cold. In a large bowl, lightly whisk the egg yolks. Put the milk and cream in a large saucepan and bring almost to the boil. Whisk the hot milk mixture into the egg yolks, then return to a clean saucepan over medium heat. Using a wooden spoon, stir constantly until the custard thickens and coats the back of the spoon. Do not let it boil, as it will curdle. Strain through a fine sieve, then allow to cool to room temperature. Put the extra 200ml of balsamic vinegar in a heavy-based saucepan over medium heat. Bring to the boil, then reduce the heat and simmer until it reduces to a syrup consistency. Remove from the heat and set aside to cool. Whisk the cold sugar toffee mixture into the custard. Transfer to an ice cream machine and churn. Alternatively, transfer to a shallow metal tray and freeze, whisking every couple of hours until creamy and frozen. When the ice cream is nearly frozen, gradually pour in the reduced balsamic vinegar and stir through to create a rippled effect, using a skewer of fork. Preheat the oven to 160C. Cream the butter, sugar and lemon zest together in the bowl of an electric mixer until light and pale. Add the honey and flour and beat until smooth. Line 2 large baking trays with baking paper. Using a spatula, smear 8 very thin layers of wafer mixture in an oval shape about 10 cm long, then sprinkle with the rolled oats and bake for 3 to 5 minutes, or until evenly golden coloured. I always make extra to allow for breakages. Remove from the oven, working quickly, using a clean spatula, carefully remove one wafer and shape it by placing over a rolling pin to curl. If the wafers are too soft to remove, just wait a moment and they will set hard enough to handle. If they set too quickly and aren’t quite the desired shape, just return them to the oven for a moment and they will flatten out again. They are incredibly resilient, although look very delicate. Repeat the process, lining them up along the rolling pin. Make sure the rolling pin does not roll. When the wafers have hardened remove from the rolling pin and repeat the process for the remaining wafers. Returning them to the oven to soften if needed. The wafers will keep for a few days in an airtight container. Combine the sugar and just enough water to cover in a small saucepan over medium heat and stir until the sugar has dissolved. Bring to the boil, without stirring, until the syrup becomes golden in colour. Immediately remove from the heat and carefully add the orange juice. Add the chopped figs, star anise, cinnamon and the cracked black pepper. Return the pan to the heat. Bring to the boil and cook for 3 minutes, then remove from the heat. Strain through a fine sieve, squeezing through as much of the liquid as possible, then set aside. Preheat the oven to 200C. Place the figs cut side up, on a baking paper lined tray. Dust liberally with icing sugar, then roast for 8 minutes, or until the figs have begun to caramelise and are golden. To serve, place a curved wafer on each serving plate and arrange two or three fig halves in the centre of each wafer. 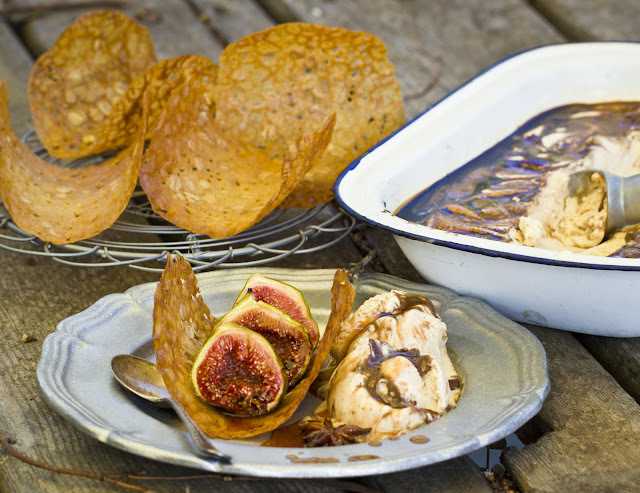 Drizzle the spicy syrup over the figs and serve with 2 scoops of balsamic ice cream.